Chelsea Summerhouses are often asked about planning requirements for installing summerhouses and gazebos. If you do need planning permission, don’t worry Chelsea Summerhouses offer a no fee service where we submit any planning applications on your behalf. We liaise with your local authority from start to finish and only in very rare instances is planning not granted for our summerhouses. The property is not in a conservation area, area of outstanding natural beauty or similar. The property is not a listed building. The summerhouse is positioned more than 2 metres away from the boundary. If the summerhouse or gazebo is to be positioned less than 2 metres away from a boundary then no part of the building can exceed 2.5 metres in height. 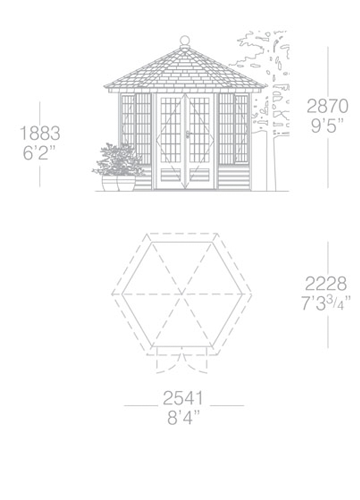 The total area of the summerhouse or building does not cover more than half of the total area of the garden (excluding the area of the original house). The height of the summerhouse does not exceed 4 metres with a pitched roof or 3 metres for a flat roof or in any other case. No part of the summerhouse projects beyond any wall of the house which fronts onto a road or footpath. The summer house is situated 5m away from the house. Or if any part of the summer house is within 5 metres of the house, it should not have a cubic content (length x width x height external measurements) greater than 10 cubic metres. The summerhouse contains no sleeping accommodation and the total floor area does not exceed 15 square metres. There is not a planning condition attached to the original planning consent for the property stating that no sheds or other structures can be erected without the prior approval of the local planning authority. If you have any doubts it is always advisable to phone your local planning authority for specific advice concerning your property, as it is your responsibility to gain necessary planning permission before installing any external garden building. The above is a guideline list to assist our customers and these guidelines are only intended to give an overview of the regulations but may be subject to changes in legislation. For any further advise, please call us on 0800 331 7742.